Our soaps are made from all natural vegetable oils, scented with pure essential oils from plant extracts and colored with organic herbs. We use no synthetic fragrances, colorants or preservatives in any of our soap products.The result is a gentle bar suitable for all skin types, even for those with sensitive skin. The fragrances I received were Lavender, Mississippi Mud, and Orange Patchouli. One thing that happens in my house when I get a package is the kids swarm on it like crazy. They usually pick up the mail when they get home from school, so they always want to see what is in the package. The YesterYear Soap was no exception. We ended up having to divvy up the soap. I took the Orange Patchouli, my son took the Mississippi Mud, and my daughter took the Lavender. We've all been using them and really like them. The first time my daughter used it she said her skin felt really clean and soft. We looked at the ingredients and where really happy about what we saw. Ingredients: Olive Oil, Coconut Oil, Soybean Oil, Organic Shea Butter, Water. Wow, this is so natural & great for your skin! I really like these soaps and they smell great too. I would like to win becasue i love all differant kinds of soap, you can call me a soap junky! I'd love to win this, because I absolutely love luxurious bath items. Let's face it--how many times in ordinary life do we get to indulge in sheer luxury? Not often.Even if there is no time for a long hot soak in the tub, soaps like these bring luxury even to a routine daily shower. I'd like to win because I am trying to get rid of all the toxic chemicals in my life, and using natural soap is really important! I love scented soaps. I don't use perfumes but like the light scent soaps give me. I'd like to win because I love handmade soap. I love handmade soap and would love to try this. I have sensitive skin and I would love to try this soap made from natural ingredients. I would like to win this because my skin is sensitive and I like trying out different types of soap. I love homemade soaps and my local company has gone out of business, so I'm looking for a new one that I like. 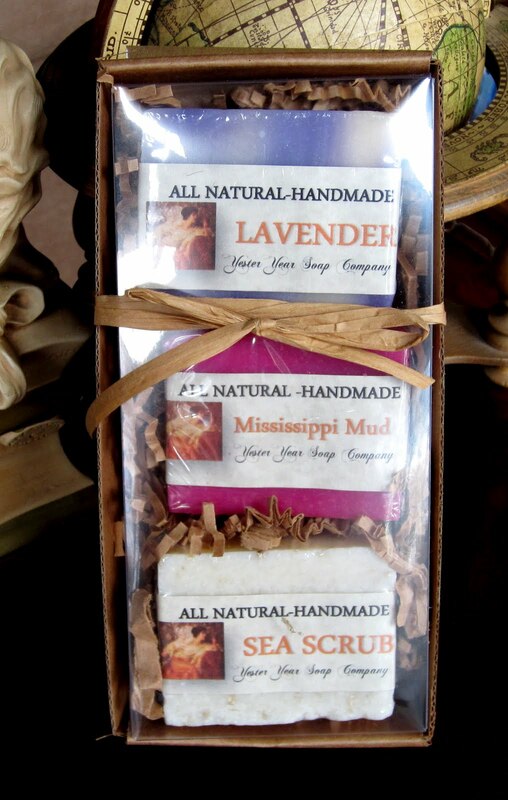 I love to use all-natural handmade soap, thanks! I always love finding new soaps. It's interesting to see what smells there are. I would like to win because I love how my skin feels after using this soap! I love trying bath and body stuff particularly if it is scented and I like the fact they are gentle too. I'd love to win because I love their ingredient list! Id love to win this because I love finding and trying new soaps I enjoy making up gift baskets for family and friends on birthdays and other occasions and am always looking for new products to buy and put in them to make them unique . I would love to win because I love trying new scents in the shower! I would like to win because I have become a real fan of these handmade soaps. My sister loves natural soap like this and I would love to surprise her! I love all natural handmade soaps especially with shea butter because they are so gentle and moisturizing on my skin. I adore handmade natural products! These sound amazing! My daughters birthday is coming up and she loves nice soap. I have really sensitive skin and find that the ingredients in handmade soap are usually the best for me. I would love to win because I love trying new soaps. I'd like to win because I'm a huge fan of homemade soap. Email in profile. I would like to win because I love lavender and it soothes the skin!! It is always nice to try new handmade items! I would like to win because I have sensitive, dry skin and it sounds like these would be a good thing to try. I'd like to win because I love soap! I would love to win because I love trying new bath products. I'd like to win this because I looked at the products on their website and the scents sound great. Florida Pink Grapefruit, and Snowmint sound wonderful. I would love to win this because my skin is sensitive and does better with all natural products. I bet it would smell great! I love good smelling soaps. I bet these smell wonderful, would love to try them. I would love to win this because I love a really great soap. The scents sound great too. because i love handmade soap! because who says no to free soap!! I have super sensitive skin and so i love trying all new natural stuff. My family uses all natural bar soaps exclusively, we love finding new producers and scents! I would like to win, because I love handmade soap. I'd like to win this because I truly love handmade soaps. I love soaps and shower gels. I would love to try these.